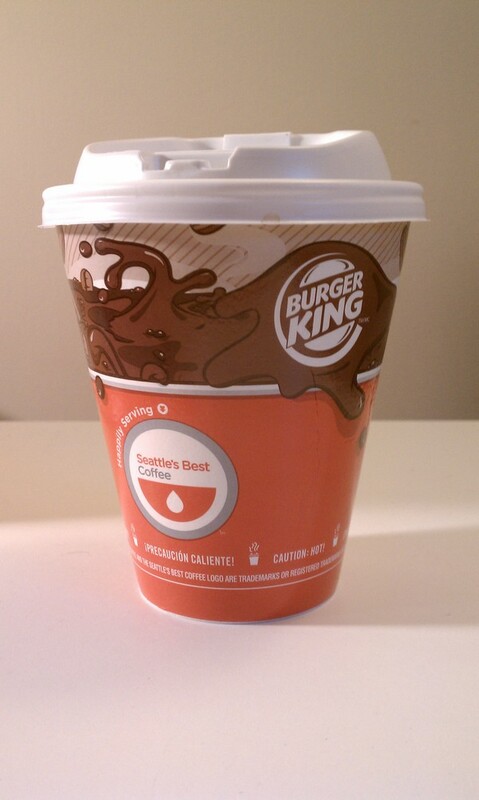 I will be reviewing Burger King Seattle’s Best Coffee but first I wanted to take a moment to share something with my readers. I just wanted to say thank you very much for reading and commenting on my blog over the last couple of months. It lights up my face every time I make a connection with a new company or get a new comment and makes my day. So thank you and ahead of time I want to wish all of you a happy holiday season coming up. Now back to the review portion of this post. Ahhhh! Black Friday shopping is part sport and part thrifty shopping. I was on my way back from Target with a couple DVDs in hand when I saw the Burger King and remembering it was Friday stopped in for a much needed free 12oz. hot Seattle’s Best brew. Unlike many places Burger King doesn’t seem to add your sugar and cream into the coffee for you while dining inside, which could be a plus if you’re particular about the amounts of each. The quick way to describe the coffee is the brew that bridges a gap between Dunkin Donuts mild blend and Starbucks in your face dark roast. The coffee has a deep earthy nutty taste to it with more smooth bitter overtones. Burger King has done a real good job revamping their breakfast menu and with the addition of a good strong recognizable coffee are in a good position for morning sales. 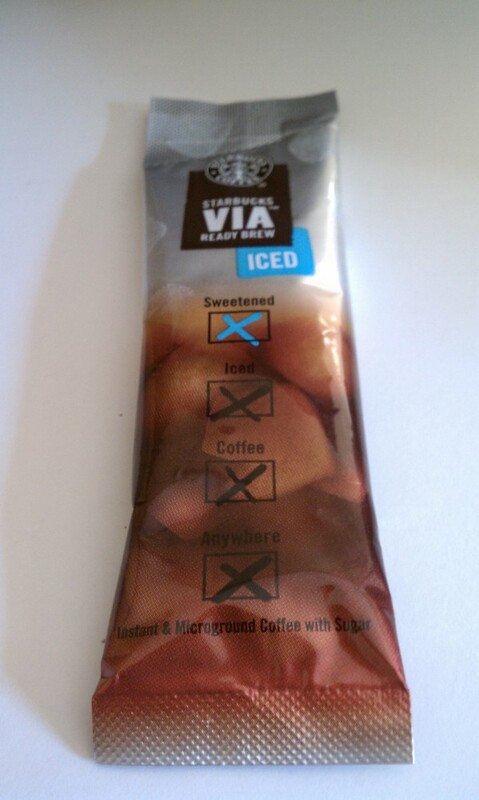 I long while back I received a free package of the newest VIA ready made coffees to come out of the Starbucks labs. The interest for me was the fact it was a ready made iced coffee. I am truthfully not the biggest fan of Starbucks for three reasons: I am low on funds constantly, theres not a lot around in Massachusetts in my area, and I am not the biggest fan of dark, real bold coffee. I mean if I have to drive twenty minutes to the nearest Starbucks when I have probably 40 or so coffee shops in my area before that, I am not going to be going to the physical location Starbucks Stores anytime soon. But now the planets have seemed to all align and they introduced a retail, iced coffee that is more accessible and designed to have around the house for on the go or a lazy afternoon, I don’t know, writing a review on coffee maybe. The process of making this iced beverage is quite simple. Rip or cut open the over-sized pouch. Pour the contents into a tall glass and added 16.9 oz of cold water. That’s right, the same amount in a water bottle if you have those around or it’s just a little more than 2 cups. Use a spoon to stir vigorously for about twenty seconds to thirty seconds. Add whatever extras you want, like cream, ice, or flavorings, and enjoy. This morning being out of a vanilla hazelnut mix I have, I opted for a my standard half & half and 2 ice cubes. Before adding sugar, I tasted the coffee to see if I would need it since it does contain some cane sugar already in the microground mix. To my surprise i found the sugar just right to not kill the delicious coffee flavor but at the same time make it very drinkable. The coffee itself blended into the water well and had a bold flavor and a certain smoothness to it I found very soothing and refreshing. Like I mentioned before I am usually not one for a very strong coffee but with my little bit of half & half the balance seemed spot on. I would definitely be happy ponying up the 5 dollars or so for a 5 pack of these to keep in my room at all times. One dollar per Starbucks quality iced coffee is worth ever penny even if I have to buy my own half & half to add to it. I hope they come out with some variations on the iced brand with some flavors like vanilla, hazelnut, and cinnamon but I have no news on if they will yet. Today for something different I am reviewing a k-cup. Don’t know what a K-cup is? A K-cup is a single serve dose of coffee designed for a Kuerig coffee machines, it’s like having a coffee vending machines in your own house. The flavors vary and include flavored, regular, decaf, specialty drinks, iced drinks that are designed to be iced down, and teas. This series of donut house is inspired by the diner or donut hut coffee many people drink daily. 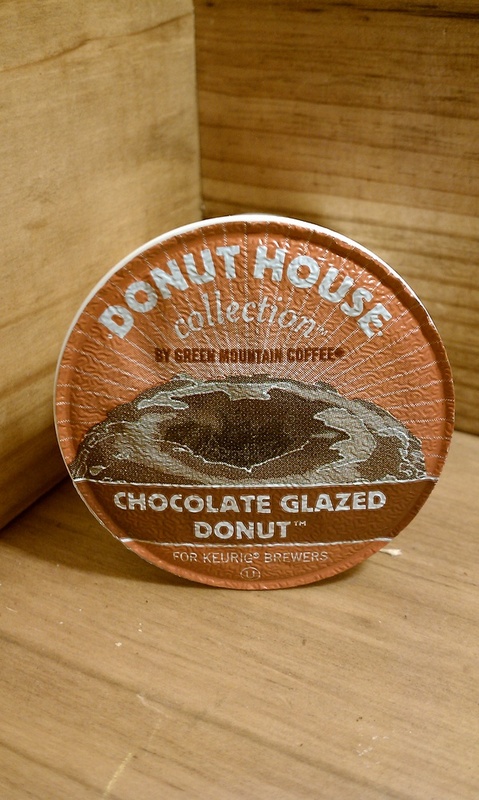 The chocolate glazed donut has a bitter cocoa taste and a creamy cake like mouth feel to it. It resembles a donut but doesn’t quite make my favorite list. I have had better coffee flavors before but this one is a very unique flavor most will appreciate. I also have to premise that I am not a hot coffee drinker so my brewing and taste buds are a little skewed on this taste. Its definitely worth a try and the regular donut house is really worth it alone. Green Mountain coffee owns this coffee line and I have always enjoyed the product they put out and have even visited the main store in Vermont. Question of the Post – Whats your favorite type of coffee?